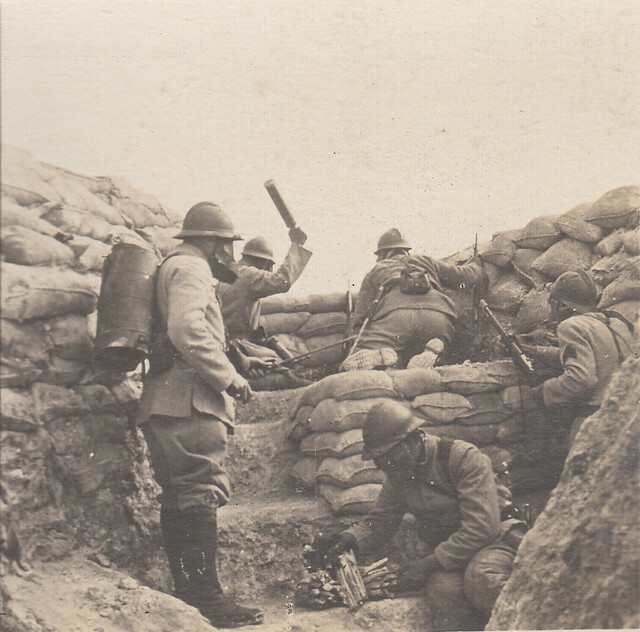 By 1916 the French Army was defending nearly two thirds of the Western Front and in many respects of all the combatant nations had reacted mostly quickly to the conditions of trench warfare; they were the first to adapt their conspicuous uniforms to wartime conditions with the implementation of Bleu Horizon, the first to introduce steel helmets with the Adrian helmet and during the winter of 1914/15 widely introduced trench weapons and hand grenades. This image shows a typical French front line trench in 1916. All the men wear Bleu Horizon tunics and Adrian helmets. The image is not likely to have been taken in the front line as the men are too exposed, but it looks like a typical sap used in forward positions. The man holding up what looks like a rolling pin is in fact holding a Barbele Grenade that was used to cut paths in barbed wire defences. All the men are wearing French M2 Gas Masks; some 29 million of these were produced and could give five hours protection against phosgene gas. The man with the canister on his back is holding and using a Vermorel Sprayer; this was a pre-war piece of agricultural spayer used to dispense a solution that would help disperse gas. Both sides used them during the war. This entry was posted on 20/02/2012 by sommecourt. It was filed under France, French Army, French Front, Gas, Great War, Western Front, WW1 and was tagged with Bleu Horizon, French Front, Gas, Gas Mask, Poilu, Vermerol.